In this bathroom, its relaxed, contemporary design begins with its color palette and ends with its sharp hardware. The cool gray and taupe tones permeate the space and give it a distinctly calm aspect, ideal for the space that invites you to unwind after a long day. The palette results in an ambiance reminiscent of a sophisticated home spa. Adding the element of functionality that every shared bathroom needs, the double-sink vanity offers plenty of storage space. Contemporary style hinges on a clean aesthetic, here exemplified by unobtrusive cabinetry, countertops, and flooring. 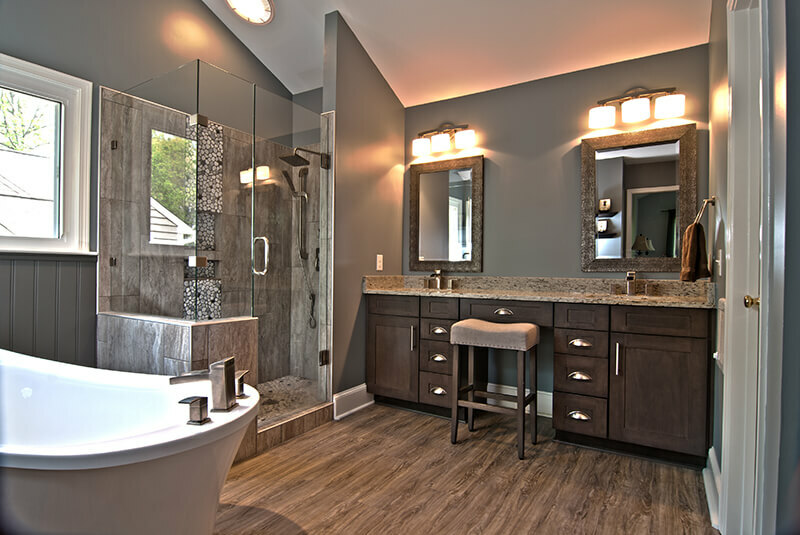 In this particular space, these elements work to maximize the bathroom and make it appear larger than it is.